All the recent posts in the blogosphere about the American Library Association conference here in DC have gotten me thinking about my own relationship with libraries. When I was a little kid I practically lived at the library. 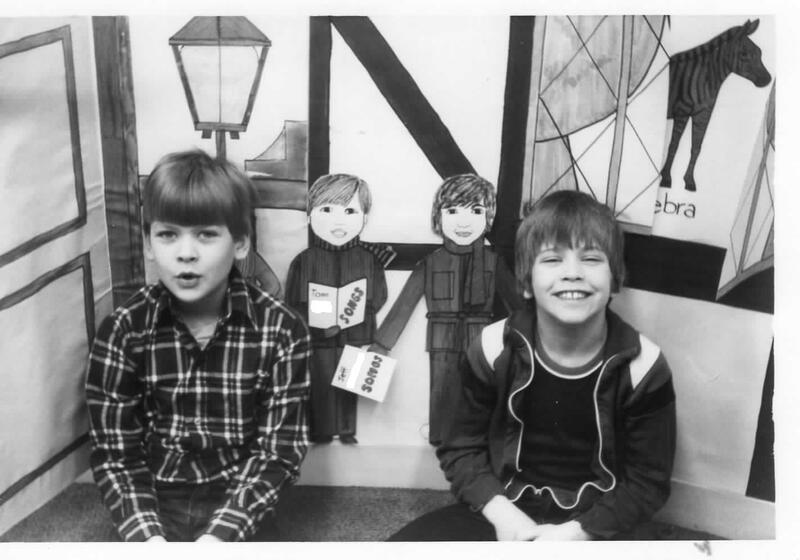 About the time I was seven years old, a brand new library opened just two blocks from my house. I was well aware of it even before it opened because my older brother had been assisting the construction workers by making trips to the Dairy Queen for their lunches, scoring himself DQ treats as payment for his efforts. Don’t think I wasn’t jealous of that. And when the new building opened it was like a revelation. At that point the books themselves were somewhat secondary to my interest in the new facility. It was this big (to me) modern (to me) building the likes of which I had never really been in. It was a dark brown brick building with a curving wall, giant doors, and what seemed like acres of bright green carpet apparently meant to suggest grass. Growing up in an old house that was perpetually being remodeled in the old part of the small town of Elk River, Minnesota, the new library was like a fantastic spaceship. And I was just old enough to make the short trek all on my own. Part of your father fit inside your mother like a key in a lock, like a foot in a sock. And of course there were also the programs: reading programs, summer films (pre-video), hobby night, and many others I know I am forgetting. When I was still quite young, Janet, the librarian in charge of children’s programs, created this giant Dickensian holiday street scene to go up on the wall in the children’s area. It was like one of those advent calendars where there is a window that opens for each day until Christmas. Except it was giant, it had to be at least eight feet tall and covered the whole wall. My friend Jeff and I were lucky enough to be able to help Janet do some of the coloring which we loved. We were rewarded by being included in the Victorian vignette as little carolers. Despite being over the moon about this at the time, I oddly did not remember it until recently when I came across this picture in my parent’s photo album. I am the one on the left. When I was eleven my sister got a job at the library which I thought was the coolest thing ever. Five years later when I applied for a library page position of my own I thought I was a shoo-in. Not only was I a sibling legacy, but I knew that library backwards and forwards. I knew the Dewey decimal system not because I studied it, but because I knew every single book on the shelves and where they were located. And there wasn’t an element of the collection that I hadn’t used over the previous nine years. Periodicals, the A/V collection, every section of books, the catalog on microfilm, the inter-library loan system. I knew it all. I even knew more than I should about romance novels having indulged my OCD on more than one occasion by surreptitiously organizing the twirling racks of mass market editions by publisher and the color of the spines. So imagine my surprise when I didn’t get the job! The head librarian was new and not someone who had known my years of hanging out at the library. He hired someone a year younger than me on the notion that they wouldn’t graduate from high school as soon as I would. I was crushed. Not only because other job prospects weren’t so hot, but this was MY library. Well, after a week the other guy didn’t show up for work. I happily stepped in on short notice when the call came and needed almost no training whatsoever. It was during my two years working there that I really began a relationship with books and other book lovers. I had always been a reader, but this was the first time I had the chance for adult-like conversations with colleagues and patrons about books. And what great friends I made while working there. A wonderful woman named Mick (short for Margaret) eventually replaced the head librarian who hired me and children’s programs were taken over by a kind, creative, bubbly woman named Georgia Jones who for some reason always made me think of a young Connie Francis. We had so much fun it was astounding. Probably the best work mates I have ever had. With the books, the gossip, and the giggling, I didn’t mind that I was only making $3.25 an hour. Unfortunately my career at the Elk River Public Library was cut two months short. Needing to make more money the summer before I went off to college I ended up working at a Sanford and Sons, a potato farm in nearby Big Lake where I would make a whopping $3.75 an hour and get many more hours than my 20 hours a week at the library. Needless to say, working at the potato farm was not as fulfilling as working at the library. 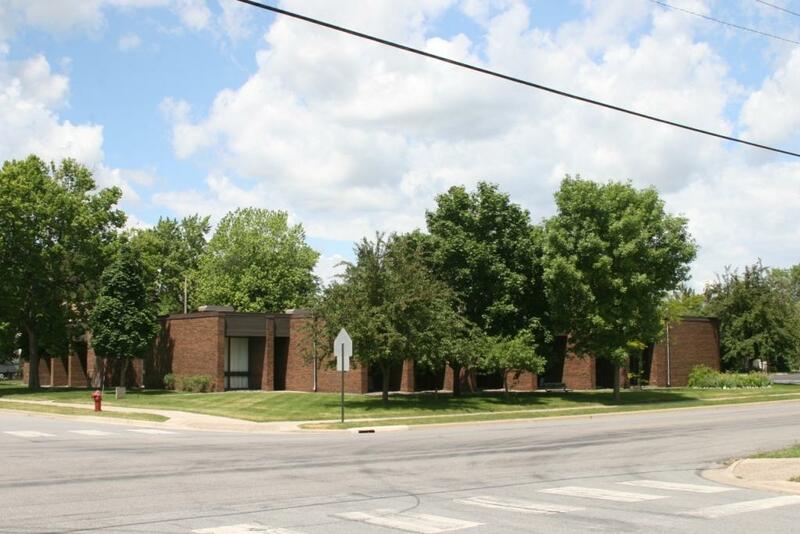 The place where it all started: The old “new” Elk River Public Library. They have since closed this library and opened a bigger one out on the highway in a location that no 7-year old is going to be able to walk to. And who couldn’t like the library system at the University of Minnesota where I went to college. With almost 7 million volumes in 14 collections, it is a treasure trove I still miss. 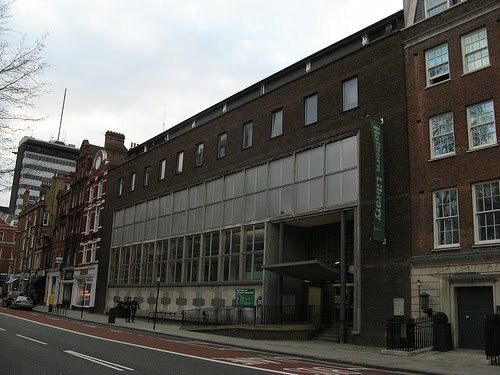 The Holborn Library, not a fantastic library but it was my local back when I worked in London in 1992. 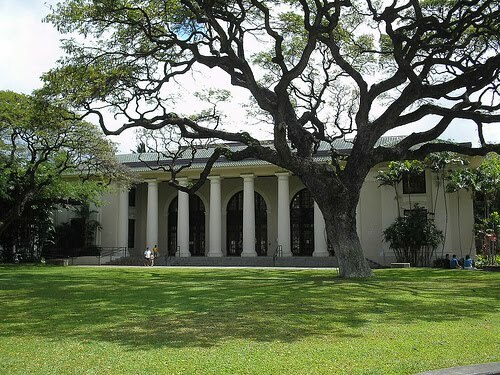 An old Carnegie Library, the Hawaii State Library in Honolulu was a great place to hang out during my two years in graduate school at the University of Hawaii. This was the place where I would head for pleasure reading as soon as the semester was over and the place where I first met Willa Cather, Vladimir Nabokov, James Baldwin, Leo Tolstoy and many others. A real time of discovery in my mid-20s. 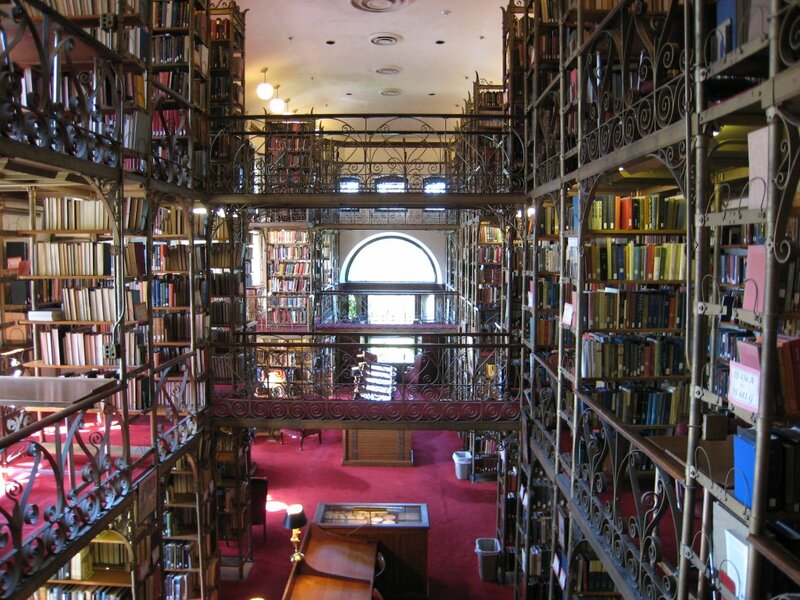 The libraries at Cornell University in Ithaca, New York were of course wonderful but I didn’t spend as much time in them as you might think while I was in graduate school there. I was studying Regional Planning and much of the data we needed in our studies and research was available online by the time I was there in 2000. Still there were a few wonderful places to immerse myself in books. And then the sad case of Washington, DC. I haven’t yet checked out the branch in my new neighborhood, but my experience with DC libraries has been less than gratifying. 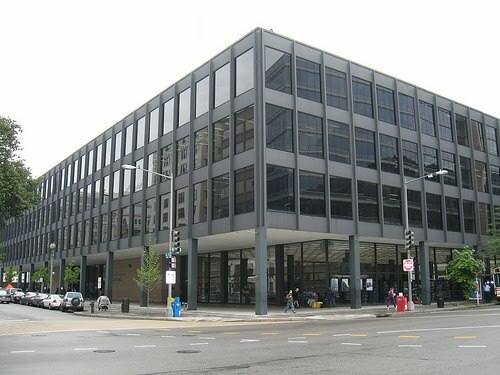 The main library is a Mies van der Rohe building that has seen better days and always feels more like a homeless shelter than a library. I think the majority of folks in this very highly educated part of the country must be buying all of their books. 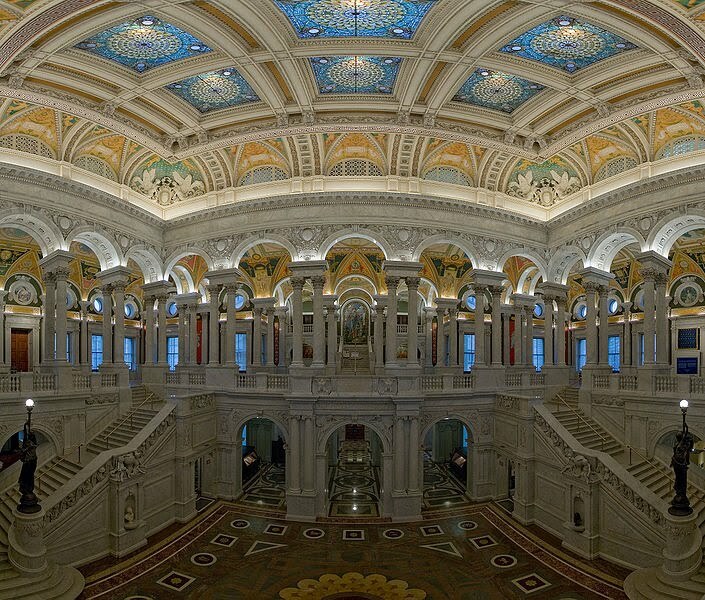 Of course there is always the Library of Congress which is an unbelievable resource, but not one that one uses for anything other than serious research. Unfortunately, between the sad state of libraries here and the fact that I have been buying so many books in recent years, I don’t go to the library very often these days. I love your library stories. I wish I got to work at a library when I was young! What great library stories. Fantastic post! What a wonderful post. 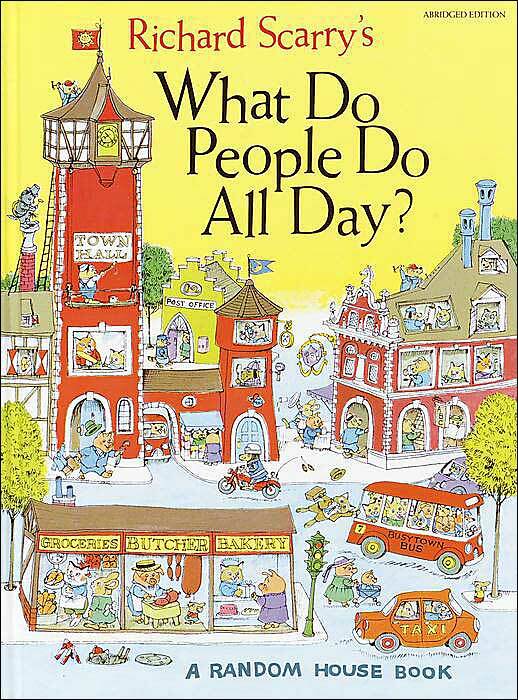 I Loved that Richard Scarry book. I remember it very fondly–when I was little it was my favorite book to thumb through and look at the pictures of those cutaway buildings and all the people in them. My library history is not so illustrious and the library I used when I was young is now gone. The one that took it's place was very ultra modern when it was built, but has now seen better days and like your local library is almost as much a homeless shelter than a place to enjoy everything the library has to offer. I still use it a lot and go at least once a week, but I tend to request all my materials on line and just go and pick up my books. Browsing isn't a leisurely activity as there is always some drama going on, but I still love the library. Now I work in an academic library, which has an entirely different feel and it's nice being able to read about a book someone is reading and just maybe being able to go up to the stacks and find it. Thanks for sharing photos! This was a really interesting post! I love the pictures and stories you shared. My own library story isn't quite as interesting yet, but then again I'm only up to my undergraduate right now so it will probably become more interesting as I go on- I can only hope. This IS a great posting, Thomas, and the pictures are great, too. Loved this post! I have had the pleasure of hearing (and being part of) some of these stories. Your love of libraries is certainly appreciated by me. May we always be mindful of just how much books, libraries,and the people in them, can impact our lives. This got me thinking about the libraries in my life. The tiny little library at my boarding school in Tanganyika, the wonderful marble of the St. Paul Public Library, the fact that my high school library subscribed to both Poetry and Punch, the gloomy and fascinating stacks at Walter Library at the U of MN, the Law Library at the MN state capitol used as a high school and college debater, the magnificent collection at Indiana University and treasures available in the Lilly, but most passionately the dowdy old Minneapolis Public Library now replaced by one of Mpls's perfect architectural achievements (the other perfect building btw is the new Twins stadium Target Field). Another thing about the Mpls lib: any library that has it's files of 18th and 19th century periodicals (my field of study) on open shelves available to the public gets my vote. You ahev known some wonderful libraries (Cornell has to be my favourite of the lot from those pictures). Great post! I loved your library stories – wish mine were as interesting. Thanks for sharing, Thomas! The only library that I ever truly felt was amazing was The British Library, because the idea that I could request any book and then get my hands on it was fantastic – I loved doing my research there (it just had a great feel to it). Chris: As much as I enjoyed it at the time, I am not sure I would these days. Too impatient. Verity: I didn't remember RS until I started thinking about this post. Olduvaireads: Thanks, I am glad you enjoyed it. Danielle: The one good thing about the less than nice main library here is that for a long time they appeared to have had little interest in weeding so there would be shelves and shelves of old authors like Trollope and Cather that were still there despite not having been checked out in ages. Ash: The only advice I would give is explore your University library as much as possible now while you still have access. Go poking around the staff that you dig will probably be happy for your interest. M Denise C: It was hard finding the images that could reall capture the memories. Except of course for the one of me as a kid. That one is pretty evocative. Georgia Jones: Exactly! I really hate the fact that they moved the ERPL. I guess it is a good place now for a senior center, but it just seems like another decision (among many) to abandon the old part of town. The opposite of what most places are doing these days. I cannot begin to tell you how much I enjoyed this post! I have had a love affair with libraries ever since my first visit at the Maywood branch library as a young girl. Wherever I roam, I try to visit the local library and here you went and took us all to so many grand and some aging homes to books and lore and adventure – and Richard Scarry. So goes our romance with books. music-books-steve: I don't think they go back that far, but I miss the open stack periodicals at Wilson library at the U. My memories aren't all that fond of the old downtown library. The one thing I remember very clearly though is that that is where I checked out Bernstein's Mass for the first time (on vinyl). Crazy work, but I love it. Jodie: That room at Cornell was a great place to sit. The views from the room were pretty impressive as well. Nadia: I have had some fun doing research at the Library of Congress which has 30 million volumes, but nothing too in depth. I can only imagine what it would yield given the right amount of time. Lifeonthecutoff: I like to visit libaries when traveling as well. My favorite to date is the tiny little library on Monhegan Island in Maine. They don't come much more cozy than that. Annoyingly, most of the old periodicals at Wilson are no longer in open stacks. 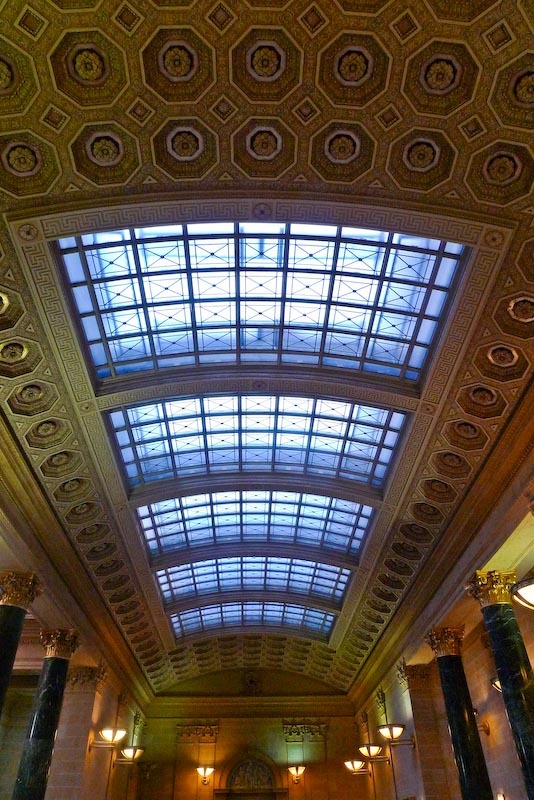 The memories of the old Mpls library are not for the building but for the extraordinary depth of the collection (for a public library in a moderately sized city). The new library is a joy, whether there just to use a computer, browse for books, read, or do serious research. The dc library is surprisingly a great library-good collections -but the main branch can be a bit sketch with the homeless people. Plus they reduced their hours. Try the Gtown branch of the library -i tend to go to it. It's in a temporary location on M street down near the key bridge till the real library is renovated after the fire. music-books-steve: That is too bad about the periodicals being less accessible. Elise: I liked to pretend it was my own home library. But I could never figure out why other people were in it. ArchitectDesign: I haven't checked out the branch in my neighborhood yet so maybe I will be happily surprised. I loved these stories and the images, especially the Cornell library -wow! Growing up I was at the library almost daily. It was one of the few bonding moments I shared with Da. He'd sit himself down at the sitting area reading something whilst I looked around, and when I'd go back to find him 45 mins later he'd be where I left him, fast asleep with his head back and mouth open! Great post Thomas – words and images. LC is a magnificent building. I “volunteered” in my highschool library and my social values were strongly influenced by the librarian and my history teacher (who often worked closely with the librarian) and then I had a paid job in my university library for the entirety of my undergraduate degree. Not surprisingly I became a librarian!